Set to take place from August 18th through August 20th (with a pre-party on August 17th at the Hard Rock Hotel & Casino Las Vegas in Las Vegas, Nevada), Psycho Las Vegas 2017 will see the legendary King Diamond perform the Abigail album in its entirety as a USA-exclusive show for 2017. Other headliners at the festival include Mastodon, Neurosis, Corrosion of Conformity, among countless other bands as support. It is already – and rightly so – being hailed as one of the best heavy lineups ever put together for an American festival. 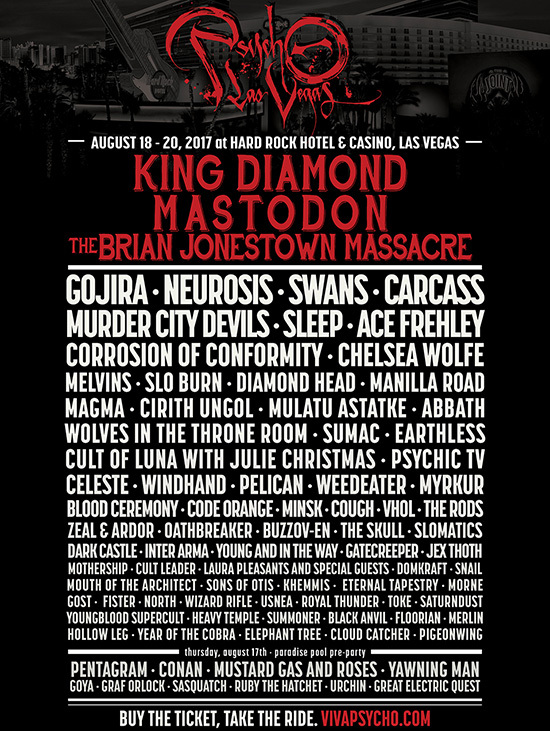 And this year, Psycho Las Vegas will only up the proverbial ante with exclusive 2017 USA appearances by French progressive rock unit Magma, black metallers Abbath led by former Immortal guitarist/vocalist Abbath Doom Occulta, and cult stoner/desert rock unit Slo Burn, fronted by Kyuss‘ John Garcia. Additionally, Mulatu Astatke, the father of Ethio-jazz, will be making his west of Chicago exclusive appearance, while Manilla Road, who are celebrating their 40th anniversary, will perform their classic Crystal Logic in its entirety as a worldwide exclusive for Psycho Las Vegas.